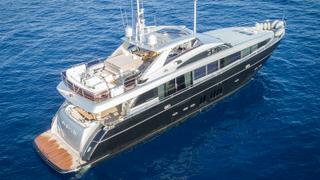 The 32 metre motor yacht Seabeach has had a central agency change and is now listed for sale by West Nautical. Formerly known as Divina, she was built in GRP by British yard Princess to a design by Bernard Olesinski and delivered in 2013 as one of the yard’s award-winning M-class series. An interior by Fendi Casa uses gloss finished walnut to create spacious accommodation for eight guests in four cabins consisting of a master suite, VIP suite, double and a twin, all with entertainment centres, television screens and en suite bathroom facilities. The impressive saloon of this yacht for sale features Fendi Eos swivel armchairs finished with hand-stitched Selleria piping and a signature carpet from the Italian design house. A bespoke extra-long Fendi dining table in macassar ebony can comfortably seat up to 10 guests, creating an ideal space for gourmet meals and there is an entertainment centre including a 50 inch Bang & Olufsen plasma television screen with a custom stereo surround sound system. The aft cockpit offers built-in upholstered seating, a table and wet bar for enjoying al fresco dining on those balmy Mediterranean days, while the flybridge comes with a Jacuzzi spa tub, wet bar, barbecue grill and an ice maker. Twin 1,925hp MTU diesel engines give her a cruising speed of 18 knots and she is fitted with digital fin stabilisers. Lying in Marbella, Spain, Seabeach is asking £5,700,000.